When the Swedish Academy awarded Svetlana Alexievich the Nobel Prize, it cited her for inventing "a new kind of literary genre," describing her work as "a history of emotions--a history of the soul." Alexievich's distinctive documentary style, combining extended individual monologues with a collage of voices, records the stories of ordinary women and men who are rarely given the opportunity to speak, whose experiences are often lost in the official histories of the nation. 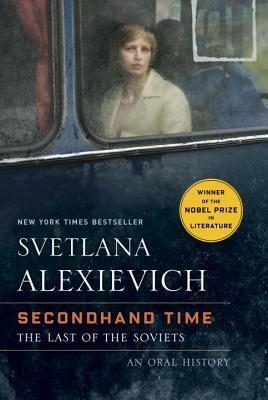 In Secondhand Time, Alexievich chronicles the demise of communism. Everyday Russian citizens recount the past thirty years, showing us what life was like during the fall of the Soviet Union and what it's like to live in the new Russia left in its wake. Through interviews spanning 1991 to 2012, Alexievich takes us behind the propaganda and contrived media accounts, giving us a panoramic portrait of contemporary Russia and Russians who still carry memories of oppression, terror, famine, massacres--but also of pride in their country, hope for the future, and a belief that everyone was working and fighting together to bring about a utopia. Here is an account of life in the aftermath of an idea so powerful it once dominated a third of the world. A magnificent tapestry of the sorrows and triumphs of the human spirit woven by a master, Secondhand Time tells the stories that together make up the true history of a nation. "Through the voices of those who confided in her," The Nation writes, "Alexievich tells us about human nature, about our dreams, our choices, about good and evil--in a word, about ourselves." Svetlana Alexievich was born in Ivano-Frankivsk, Ukraine, in 1948 and has spent most of her life in the Soviet Union and present-day Belarus, with prolonged periods of exile in Western Europe. Starting out as a journalist, she developed her own nonfiction genre, which gathers a chorus of voices to describe a specific historical moment. Her works include War's Unwomanly Face (1985), Last Witnesses (1985), Zinky Boys (1990), Voices from Chernobyl (1997), and Secondhand Time (2013). She has won many international awards, including the 2015 Nobel Prize in Literature "for her polyphonic writings, a monument to suffering and courage in our time."